Citation: Ma, Xiaoyi, Dalal Zakhary, and Stephanie Strassel. GALE Phase 1 Arabic Blog Parallel Text LDC2008T02. Web Download. Philadelphia: Linguistic Data Consortium, 2008. 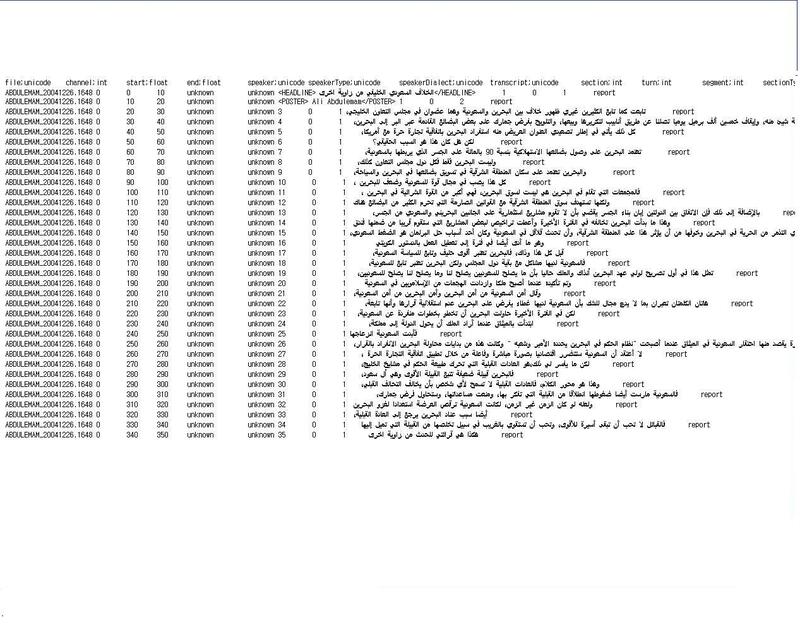 This file contains the documentation for GALE Phase 1 Arabic Blog Parallel Text, Linguistic Data Consortium (LDC) catalog number LDC2008T02, ISBN 1-58563-462-X. Blogs are posts to informal web-based journals of varying topical content. GALE Phase 1 Arabic Blog Parallel Text was prepared by the LDC and consists of 102K words (222 files) of Arabic blog text and its English translation from thirty-three sources. This release was used as training data in Phase 1 of the DARPA-funded GALE program. The task of preparing this corpus involved four stages of work: data scouting, data harvesting, formatting, and data selection. 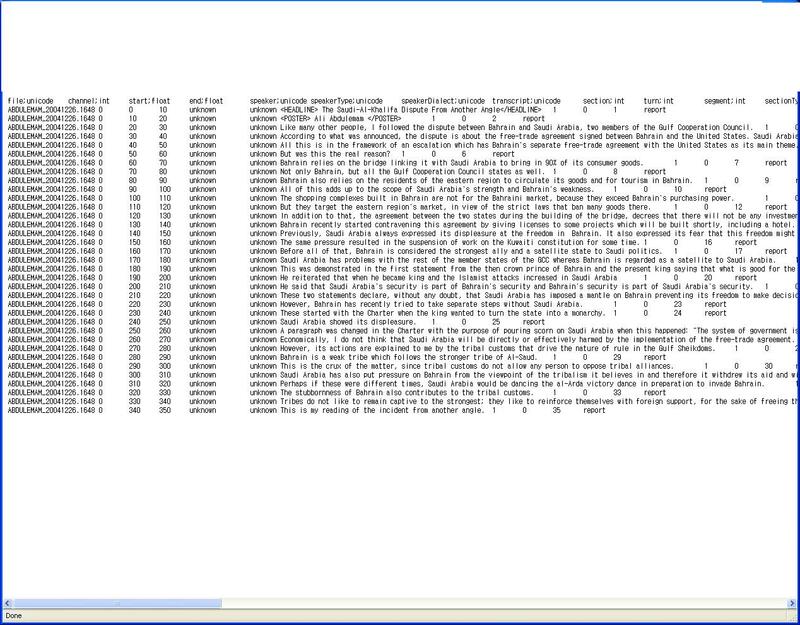 Data scouting involved manually searching the web for suitable blog text. Data scouts were assigned particular topics and genres along with a production target in order to focus their web search. Formal annotation guidelines and a customized annotation toolkit helped data scouts to manage the search process and to track progress. Data scouts logged their decisions about potential text of interest (sites, threads and posts) to a database. A nightly process queried the annotation database and harvested all designated URLs. Whenever possible, the entire site was downloaded, not just the individual thread or post located by the data scout. Once the text was downloaded, its format was standardized (by running various scripts) so that the data could be more easily integrated into downstream annotation processes. Original-format versions of each document were also preserved. Typically a new script was required for each new domain name that was identified. After scripts were run, an optional manual process corrected any remaining formatting problems. The selected documents were then reviewed for content suitability using a semi-automatic process. A statistical approach was used to rank a documents relevance to a set of already-selected documents labeled as good. An annotator then reviewed the list of relevance-ranked documents and selected those which were suitable for a particular annotation task or for annotation in general. Those newly-judged documents in turn provided additional input for the generation of new ranked lists. After files were selected, they were reformatted into a human-readable translation format, and the files were then assigned to professional translators for careful translation. Translators followed LDCs GALE Translation guidelines, which describe the makeup of the translation team, the source, data format, the translation data format, best practices for translating certain linguistic features (such as names and speech disfluencies), and quality control procedures applied to completed translations. Translators were instructed to return a 50-sentence sample as soon as it was completed. The sample was reviewed by LDCs bilingual language specialists. Subsequent deliveries were subject to quality controls as described in the translation guidelines. Low quality translations were returned to the translators for revision. All final data are in Tab Delimited Format (TDF). TDF is compatible with other transcription formats, such as the Transcriber format and AG format, and it is easy to process.